Special Kind Bit Plug which can be fixed in Drill machine too for screwing and unscrewing purpose. 7 Socket : 3/16", 1/4", 5/16", 11/32", 3/8", 7/16", 1/2"
HEX Bit : 1/16", 5/64", 3/32", 1/8", 5/32", 3/16", 1/4", 7/32"
2 Slotted Bit : 3/16", 1/4", 9/32"
classically styled Swiss Army Knife will make sure that you're equipped for life is adventures. No matter what those adventures might be. Stainless Steel Pocket Knife. Universal Drill bits set for use in any Kind of drilling Machine. A complete set having 12 Dril Bits of smallest to Big size and all sizes in between. Includes on cool carring case. 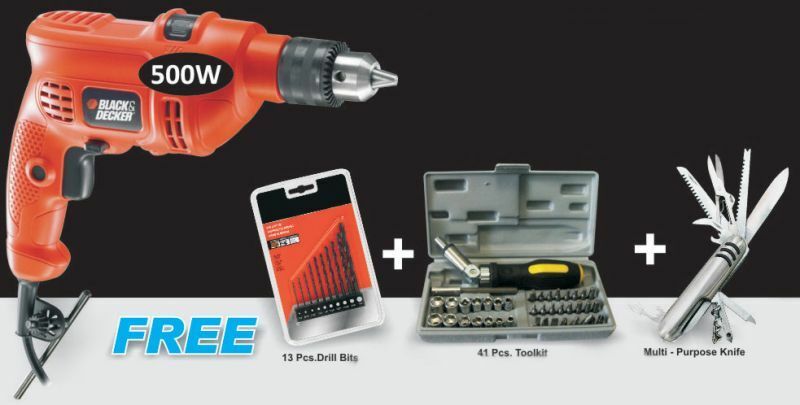 Compatible with Electric drilling machine as well as Manual drill machines. Also Works with Hammer action drills. 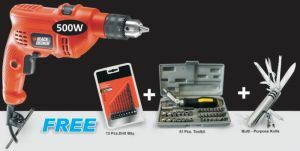 Works with all mm drills including the most popular 10mm and 13mm drills.